I was interviewed by Martin Madert of the Witness to War project. Witness to War is a 501c3 non profit dedicated to preserving the oral histories of combat veterans. 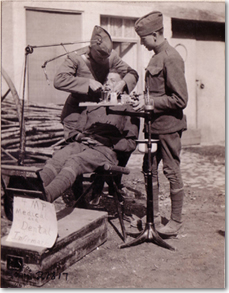 This is the full length version of my story about serving as an Army dentist in Afghanistan. A 93-year-old retired dentist finally received his diploma from The Citadel 64 years after being pulled from college to serve in WWII. Sadly, he passed away Friday, only a week after the diploma was presented to him. 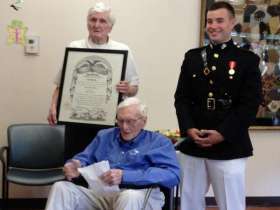 Provided by the Robert Williams family Vincent Williams (from left), 91, holds the diploma presented Saturday to his brother, Robert, 93, by a 2013 Citadel graduate, Marine 2nd Lt. Scott Holmes.